Green gram sprouts are packed with protein as we all know and I definitely find in ways to sneak them wherever possible. The usual affair is to add in salads and stir fries. But when it turns monotonous, there is a wave of rejection in my family. And that's how I ended up trying these cutlets for a change and to my surprise none could imagine the magical sprouts in them. And they thought it to be some vegetable cutlets and enjoyed with ketchup. These are very healthy cutlets and I have shallow fried them in very less oil by turning and shifting all sides to get an even brown tone. If you like to add potatoes to give an added taste then omit the bread crumbs and add boiled mashed potatoes. 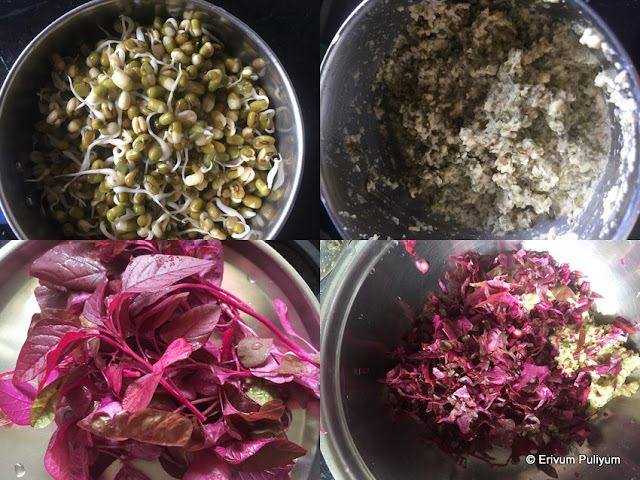 I have already posted a salad recipe with green moong sprouts, the recipe is here (take a peek if interested). 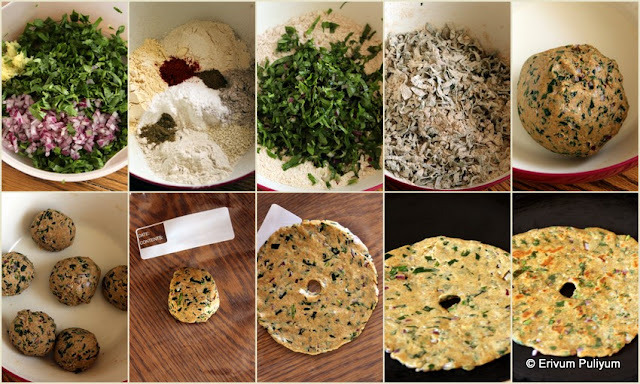 This is a perfect appetizer or after school snack for kids, am sure they will enjoy !! Wash the green gram or cherupayaru under running water. Soak in the water for 7-8 hours. Then tie the green gram in a cheese cloth. Leave it in casserole overnight to make sprouts. Once 1/2 cup green gram is sprouted,it becomes 2 cups. OR Just use sprouts if you already have made or bought and proceed further. Boil the sprouts for two minutes in boiling water by adding little salt. Drain off water and keep aside. Grind the sprouts in a blender without adding any water. Coarsely will do fine, pulse just once or twice. Wash and chop the cheera( greens) fine and add to the ground sprouts. Mix well. There will be moisture from the sprouts, in order to reduce that trim three or four bread slices and make fresh bread crumbs in a mixer. Add this crumbs little by little to the sprouts mix till you get a cutlet consistency. Add chilli powder, asafoetida(kayam podi), turmeric powder,salt. Mix well. Shape the cutlets and dip it in egg wash. Then, coat the bread crumbs and keep aside. Heat a wok/kadai if deep frying; I used a frying pan to shallow fry. Add oil(I used coconut oil) and shallow fry the cutlets till evenly browned on all sides. Drain on a plate lined with paper towel. Serve warm with ketchup. * Add a cooked mashed potato if you wish to omit the fresh bread crumbs. * Use 2 tbsp maida(all purpose flour) mixed with 2 tbsp water to coat the cutlets in place of egg. I knew nothing about extracting coconut milk(thenga paal) until I married a guy who hails from Thrissur (where coconut milk is used abundantly in every dish). They have many curries that use coconut milk and last but not the least payasam/ pradhaman that's made all over Kerala uses coconut milk. Little did I know about first, second and third versions of coconut milk(thenga paal) then. 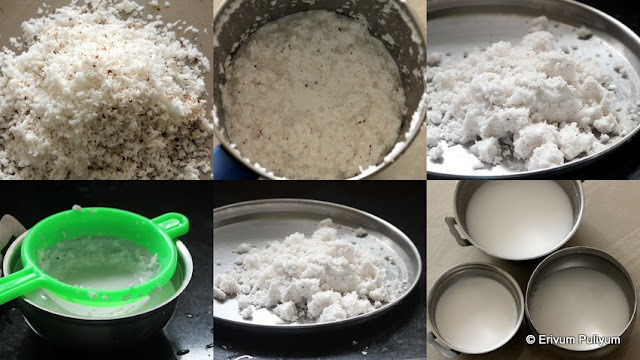 Though my mom used to extract coconut milk(thenga paal) but that was only for making any pradhaman or payasam so never got a chance to know much about coconut milk.It was with my MIL I started learning the coconut milk(thenga paal) based curries and extracted coconut milk.There is nothing fancy in this post but still I have received many requests to post about extracting the different coconut milk(thenga paal) especially when making coconut based payasams/ pradhaman. Though I have vaguely mentioned the procedure here and there in many of payasam posts but I thought this is a keeper for all times. If you are used to maggi coconut milk or are using canned coconut milk then life is quite simple but I know many would still admit that nothing brings the exact flavors of the coconut milk extracted from fresh grated coconut. Scrape or grate the coconut( *leave out the very dark portions or grate it separately), and keep aside. Transfer the grated coconut in a mixer jar and add 1/2-3/4 cup warm water( helps to extract more coconut milk). Pulse or run the blender for 15 secs to mix it up. FIRST COCONUT MILK- Place a strainer over a clean bowl and pour the coconut mix into the strainer. 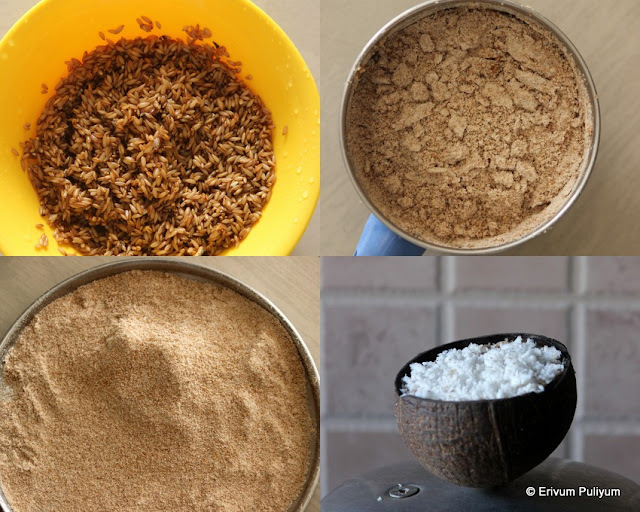 Once the milk flows down, squeeze the left over liquid in the grated coconut. Keep aside,this is the thickest and sweetest coconut milk(thenga paal). This is used as a final topping in curries or payasam like we add fresh cream to curries. After adding this milk, the curry or payasams are not boiled over as it may curdle. SECOND COCONUT MILK- Add the remaining crushed coconut and add 1 - 1.5 cups water. Pulse or run again the blender for 20 secs. Place the strainer on the next bowl and transfer the coconut mix into it. Squeeze out all liquid from the coconut mix.This is the lesser diluted version of coconut milk(thenga paal). Keep aside. THIRD COCONUT MILK- This is the last or very diluted version of coconut milk. Transfer the same coconut in the blender jar and add 2 cups water. Blend in the blender for 30 secs and transfer again in the strainer over another bowl and squeeze out the third milk completely. This is a very diluted version of coconut milk(thenga paal), has a light white color and hardly has any coconut flavors. * I have seen caterers in Kerala never pulse the grated coconut in blender and strain in strainers. I have seen them adding the grated coconut in a big urali(vessel). They add little warm water and knead it very well to extract the coconut milk. Then transfer it in a thin cloth or new thorthu( Kerala bath towel). Squeeze the milk by twisting both ends an tightening the cloth. The caterers need coconut milk in very large quantities and blenders may not suffice the need. Some caterers even use some portion of the coconut(the left out waste after extracting) in thorans(stir fry) for sadyas. That coconut doesn't have any flavors left but definitely ads to he texture and quantity of the stir fry. * The dark portions don't give an aesthetic look and also when you extract the coconut milk with the dark portions,the milk is off white or one shade lighter than white. Its better to use that part for some curries rather than for extracting coconut milk(my personal preference though). * These days we have mixers attached with coconut extractors in that case the sieving work load is lesser. * Try getting the mature coconuts to get good quality coconut milk or else the coconut milk doesn't taste good and the oil content is less in immature coconuts. * The quantity of water added depends on the amount of coconut used. So alter accordingly. * Also, the first coconut milk is extracted with very less water and the third milk is extracted with more water. * If you are using canned coconut milk, then use undiluted thick coconut milk for first milk. Dilute the 1 cup canned milk with 1/2 glass water to make second milk and you can leave out the third milk part. * MAKING EXTRA VIRGIN OIL or URUKKU VELICHENNA- The first and second milk are boiled over in a thick bottomed pan(preferably urali) on heat and is stirred frequently till the water is evaporated (takes lot of time and effort) and the pure coconut oil is left behind(the quantity of coconut oil is just 1/5 th of the total coconut milk boiled).I had made this for both my kids when they were babies and applied before bath(it smells so good and intense). 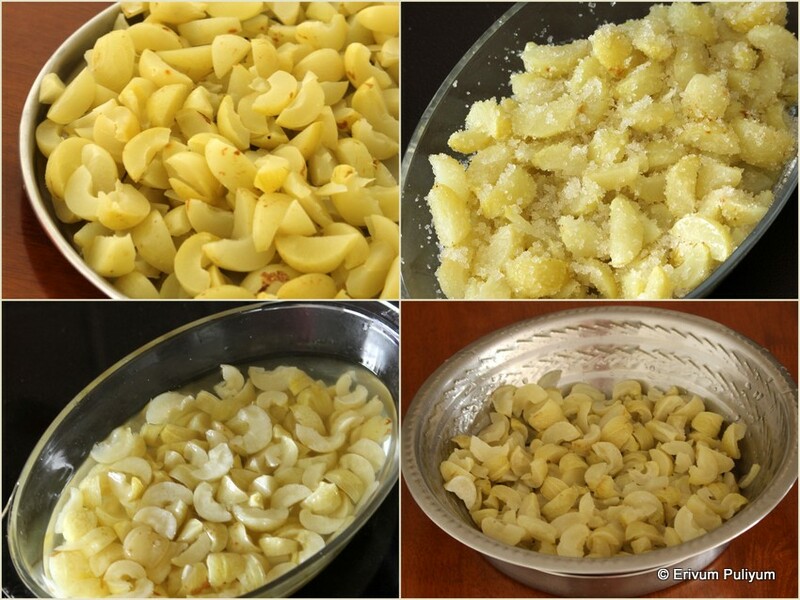 * Used in snacks like achappam(rosette cookies), paal appam. * Used in non veg curries like meen pollichathu, chicken stew, nadan kozhi curry, mangaittu meen curry(fish curry) , nadan beef mappas ,mutton stew, kerala style mutta curry. * Used in payasams/ pradhaman. I have used coconut milk in ada pradhaman, suji gothambu payasam, mulayari payasam, papaya pradhaman, unnakalari payasam ,aval pradhaman. Mulayari Puttu | Bamboo Rice Puttu | How to make Mulayari Flour from scratch ?? Have you seen a plant grow from a seed since the time you plant in the soil?? Vague question ?? Actually I was just wondering the wait to see a sapling from the seeds once we plant the seed in soil, and then wait eagerly till it grows into a plant, gradually wait till it starts to bloom or bear fruits. But how about waiting 50-60 years for the plant to bloom flowers and seeds?? Seriously its hard to wait so long and am sure we will lose patience. That's about a few bamboo trees am talking about !! Some even take 100 years for a bamboo pant to flower. And so its cultivated from the wild mostly and tribals collect the bamboo rice which is a major income of their living.Heard lots about this grain until recently when I got to try my hands on. Bamboo rice (mulayari) has lot of healthy benefits which I already listed in my payasam post so not re writing them. The grains look similar to brown rice. These grains require a soaking time of more than 12 hours to pound to a flour form and so that's the only drawback that I felt making this puttu. The puttu tastes similar to any whole grain puttu like gothambu puttu or chemba ari (kuthari) puttu. If you haven't seen mulayari(bamboo rice) then check out my post on mulayari payasam where I posted a pic of mulayari(bamboo rice). Do try this healthy puttu if you can find mulayari (bamboo rice). Pick the stones and other impurities from the mulayari if any.Wash and soak the mulayari in water for 10-12 hours or overnight. Drain the water completely and spread on a plate or on layers of paper towel for 20 mins. Transfer the rice to a blender and powder to smooth. Sieve the rice flour using puttu sieve, please check this post for better understanding. Repeat the same step if you have more rice and add the left overs after sieving. Lightly roast the flour in a pan for 2-3 minutes. Remove from stove and leave to cool. If you are storing the flour for long then, roast the flour very well or else it may go bad. 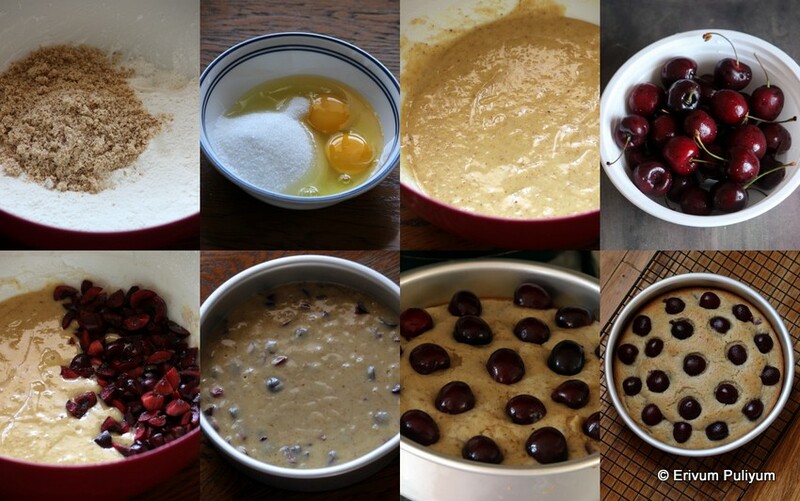 Add the flour in a bowl and add salt to taste. Mix well and add water little by little. 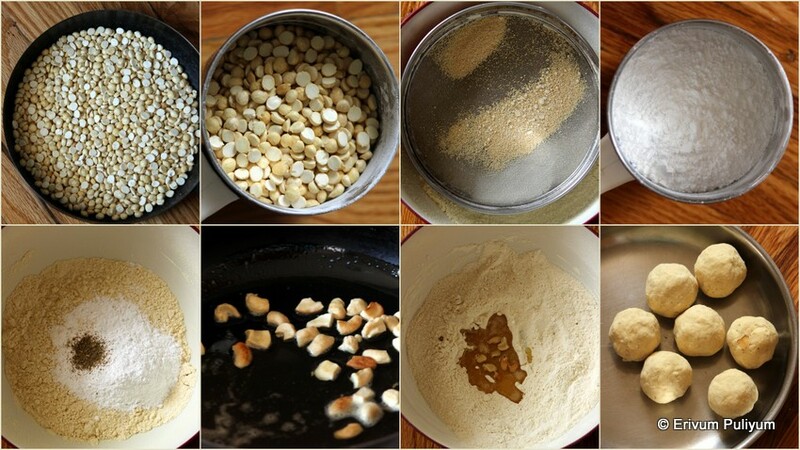 Mix well to get bread crumb like texture or press down a little flour in your palm to make a ball. If you can make a ball then, it is perfect to make puttu. Leave aside for 5-7 mins covered. The water may be absorbed and if the flour looks dry, then add more water as needed and proceed to make puttu. Heat a pressure cooker and add enough water, close the cooker without placing the weight/ regulator. Now in a cheratta puttu maker or cheratta or regular puttu maker, add grated coconut and then add the mulayari puttu podi. 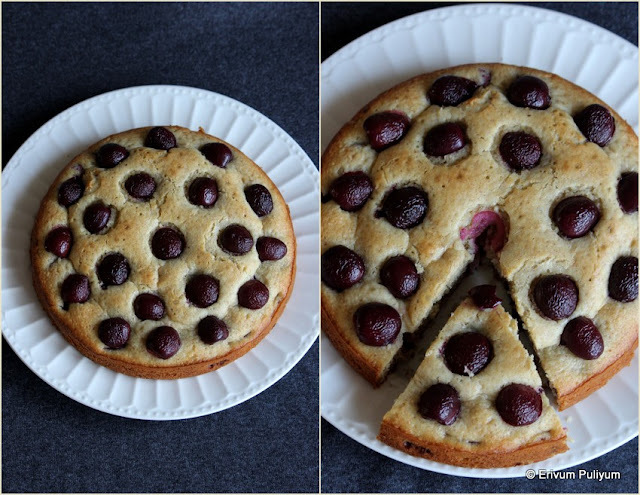 Alternate this with grated coconut in between till you reach the top. Finish with a layer of grated coconut. Place this on the cooker and let it steam cook for 5 minutes once the steam seeps out of the top layer. If you are using cheratta then cover with a small plate or lid. Remove from cooker when its done and then transfer to a plate. Enjoy with bananas or kadala curry or pappadam. * Mulayari should be soaked well in water before pounding. 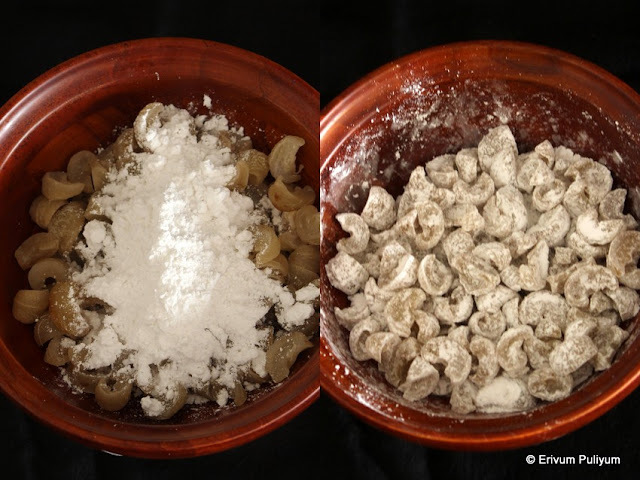 * Taste check the flour for salt before making puttu. * Always check the amount of water in the pressure cooker or else the puttu and cooker may get burnt. Pottukadala(split dalia) was invariably used whenever preparing chutneys, preparing mixture or aval velayichathu. Other than that I could hardly think about anything else prepared using split dalia(pottukadala). However, I had a packet of pottukadala extra at home accidentally. I knew this wouldn't get over in couple of months as I rarely used pottukadala on a regular affair. So on searching internet sites, I happen to see many making laddoo out of it. 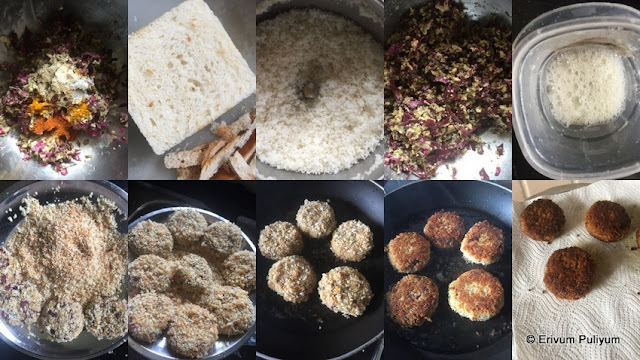 I didn't think twice before I started making these cute balls as I already had prepared moong dal laddus and they are almost similar to them. They are really soft and delicious plus they hardly need any time to prepare. How simple it sounds right?? Enjoy making them for this Diwali and enjoy with your loved ones !! Dry roast the pottukadala/split dalia in a pan on medium heat by continous stirring for 3 mins till the raw smell of split dalia disappears.Keep in mind that the split dalia shouldn't change color.Leave to cool. Add this in a blender and powder it up fine.Sieve the mixture to get smooth powder,repeat the grinding with left over coarse mixture until you are left out with very little coarse particles which can't be blended any further.Discard the coarse mixture if any left out. Powder the sugar in the same blender jar until smooth.If you are using cardamom,then add the pods along with sugar so that it gets nicely powdered.I haven't done that as I separately powder small batches of cardamom and keep.Mix the powdered sugar with the pottukadala powder with cardamom powder,keep aside. Melt a tbsp of ghee and add the broken cashews.Fry until slightly browned.Switch off flame and add the remaining ghee to the pan so that its melted. Add the melted ghee mixture little by little with cashews to the pottukadala mixture and try shaping them in balls.Add more ghee as required and try shaping them in balls.Place a lemon size mixture in the non dominant hand and press with the dominant hand to shape them. Serve or store in air tight containers. * You can use roasted split dalia(pottukadala) instead of roasting at home but make sure the roasted ones have no added salt in it. Last week was my little ones's birthday, he was super excited since the beginning of this school year. The mere reason of which was he could wear colour dress to school and take chocolates for his classmates and teachers. Sadly his birthday was always with Onam vacations for the past few years and this is the only year when Onam vacations got over early and he vcould celebrate it at school. Poor kid, his tensions... As kids we also eagerly waited for our birthdays. I remember till fifth grade I used to carry chocolates for my class mates and as I stepped in higher classes, the birthdays from chocolates shifted to samosas and soft drinks( for close friends during recess) in the school canteen. Nostalgic memories !! Gone are the days and the fun. Now the day only starts with what's for breakfast,what to pack for lunch and snacks. Coming back to today's post is a chicken recipe. 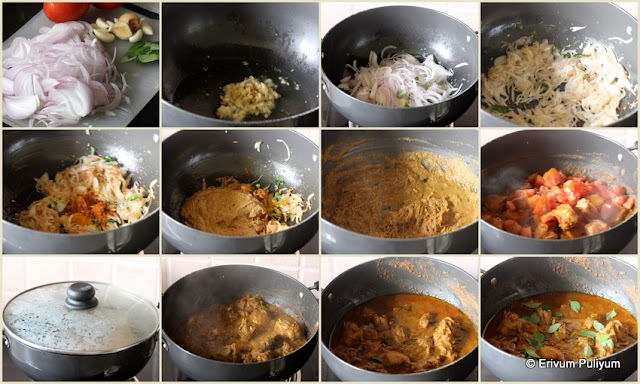 Its been quite sometime I posted a non veg recipe and here it goes- Chettinad Chicken Curry. The chettinad flavors are imparted from the dry roasted spices like our nadan chicken curry (Kerala Style Chicken Curry), check out if you haven't . I had already tried a Pepper Chicken chettinad. The curry serves perfect with chapathis/ naan/ rotis. The ingredient list may look long but the procedure is simpler and the only extra work is dry roasting the spices which you can do earlier and start making the curry. Love this curry with some hot phulkas !! Wash the chicken under running water and drain water completely. In a bowl, marinate the chicken with chilly powder and salt mentioned in the list 'to marinate'. Heat a pan and dry roast all the ingredients(except coconut) listed under chettinadu masala for 2 minutes. When you get a nice aroma then add in grated coconut. Dry roast the coconut till golden brown. Switch off flame and leave to cool. (I forgot to add pepper corns so added 1/2 tsp pepper powder to the masala). 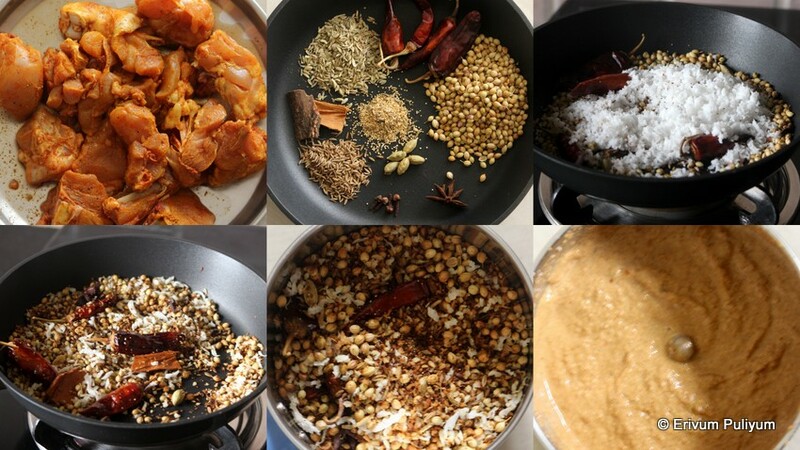 Grind the roasted masala with some water to a smooth paste. In the mean time, heat oil in a thick bottomed pan or cooker. Add the ginger garlic paste and saute for a minute and add sliced onions and curry leaves. Add a pinch of salt and saute for 4-5 minutes until the onion is wilted and reduced. When the onions turn golden brown, add the chilli powder and turmeric powder. Add in the ground paste. Cook for a minute then add 1/4 cup water. Cook again and keep stirring till the water is evaporated. Add another 1/4 cup water and cook the masala again until there is slight oil oozing out of the masala. Slide in the chicken pieces and chopped tomatoes, mix well. Cover and cook on low flame (don't add any water as chicken leaves out water). Keep checking in between if there is enough water. Mix well and add half a cup of water if required (I added half cup water once the water reduced considerably). It takes about 15-20 minutes to cook the chicken. When the oil separates and floats on top of the gravy, then the chicken curry is ready. Garnish with curry leaves and switch off flame. Add the lemon juice (I added only a tsp though it is mentioned a tbsp), give a quick stir. * Add lemon juice as per the need of sour flavors. I added only a tsp of it. * Though in the pic, I have kept 2 pieces of cinnamon and used but I felt the cinnamon was a little over powered in the curry so reduced it to one piece. * Poppy seeds are optional, if you use then go ahead and try. 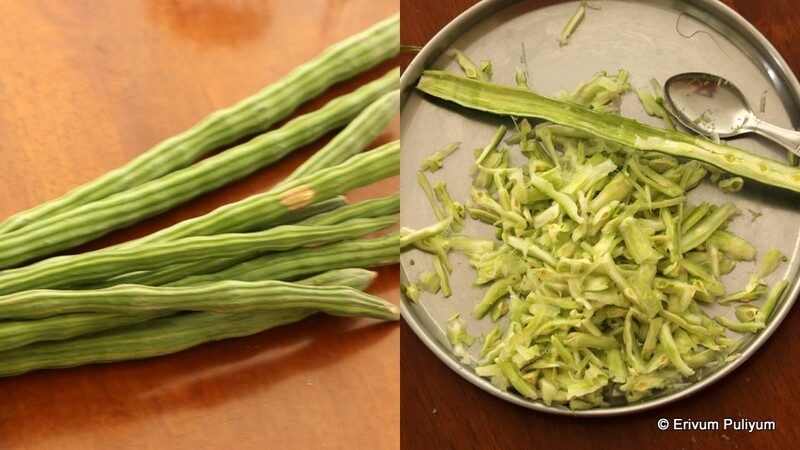 Drumstick(muringakka) is a rich source of calcium,phosphorous and vitamin C. Though we frequently add drumstick in sambar and aviyal mainly. But during season, drumstick are available in plenty. We had plenty in the backyard at parent's place and so mom used to make this thoran(stir fry) whenever drumsticks where in season. I learnt this recipe from my mom and grand mother. This time my SIL bought a pack of fresh drumsticks from their garden when she visited us sometime back. That's the time I thought of preparing this thoran(stir fry). This is a simple stir fry and has the drumstick flavor in abundance. The only hardwork in making this thoran(stir fry) is scraping the flesh out from the drumsticks. The seeds adds a nice crunch in between the thoran(stir fry). Make sure to select the tender ones to make this thoran(stir fry) else the over mature seeds will be very bad in taste. If you like the drumstick flavor then you will definitely love this. Give it a try and enjoy !! Wash and cut the drum stick lengthwise as shown in pic. Using a sharp edged spoon,scoop out the flesh by holding it in your hands. If there are long strands of flesh then finally cut it short using a knife. Don't make it very small, just keep an inch long strands. Also make sure to select tender variety moringa(muringakka) / drumstick, over mature drumsticks doesn't taste good and the seeds doesn't bite through. In the mean time coarsely grind the ingredients listed under 'to coarsely grind' in a blender. Heat oil in a wok/ kadai / cheenachatti. Add mustard seeds, when it splutters. Add the sliced shallots and curry leaves. Saute till its wilted. Add the drumstick flesh (muringakka) and the coarsely grind paste,salt. Mix well, add 2tbsp of water. Simmer the flame and let it cook covered for 7 minutes. Toss well and cook for another 2 minutes till the moisture is dried up. Switch off flame and serve with cooked rice. * You can even add green chillies vertical slit separately without adding with the coconut. How was your Onam, friends?? We had a very good Onam at home with family. Kids made pookalam, wore new dresses,had some photo sessions. All loved the sadya and enjoyed the festive mood completely. Soon after Onam, we went on a short trip to Mysore,also exploring the northern side of Kerala. This is the first time when I went visiting Kannur, Kasargod, Mahe and Thalassery. Though being a keralite, I never had a chance to see these places before but we didn't get much time there. It was just a short glimpse of the railway stations from the train as the main destination was Mysore. Mysore tour was good,stay was excellent and my younger one thoroughly enjoyed the zoo. What do you like most about Mysore?? I love the Brindavan gardens for sure, the musical fountains. Kids had not seen Mysore before though we both had visited in our childhood. For kids,it was an ezciting experience. They totally enjoyed it. Below is the pic of our this year's Onam sadya at home.Also, there was rasam, we made suji gothambu payasam and palada as payasam. I have made Everyone totally enjoyed the sadya and the homemade sadyas definitely tastes delicious with all the items,finally ends with payasam. Coming backj to today's post-Amla (nellikka) syrup. Amla has so many nutritional benefits to list down.This sharbat is made from left over sugar syrup left out after making amla candy which I will post soon. This sharbat has a unique flavor of amla (nellikka) and tastes awesome to refresh a long tiring day. What more do you need to feel fresh?? Do give this a try in this amla(nellika) season. The post of amla candy is here. Boil the reserved juice from amla candy in a pan for 10 minutes. Add the roasted cumin powder if you like the flavor or else just leave out. Cool and store in refrigerator. Add a tablespoon of this sharbat to a glass of water and drink.